"The easiest way to email your leads today!" Now you can easily import leads directly into this application to mail straight from your desktop. In fact, it's so simple to use... even my 7 year old son can install the software and send a personalized message to any number of leads in less than 10 minutes! Choose a leads file from your computer and click on "Send Mail"
And that's only the very first time you use Add2it LeadsMailer Pro. Starting the second time you can skip over step 1 and 2 and go straight to step 3. Now... how easy is that? To see videos of the three steps above, simply click on the video icons after step 1, 2 and 3. All other functions will be explained through the same kind of simple to follow videos in the manual that comes with the software. "It's easy to install, works well and it's FAST!" I love Add2it LeadsMailer Pro. It's easy to install, works well and it's FAST! No mucking around at all. Just load the leads and send. I didn't even need to change the default email! But I can see many uses for it. It's very user friendly and desktop applications are definitely the way to go. I'll be recommending your software to my GDI downline for sure. 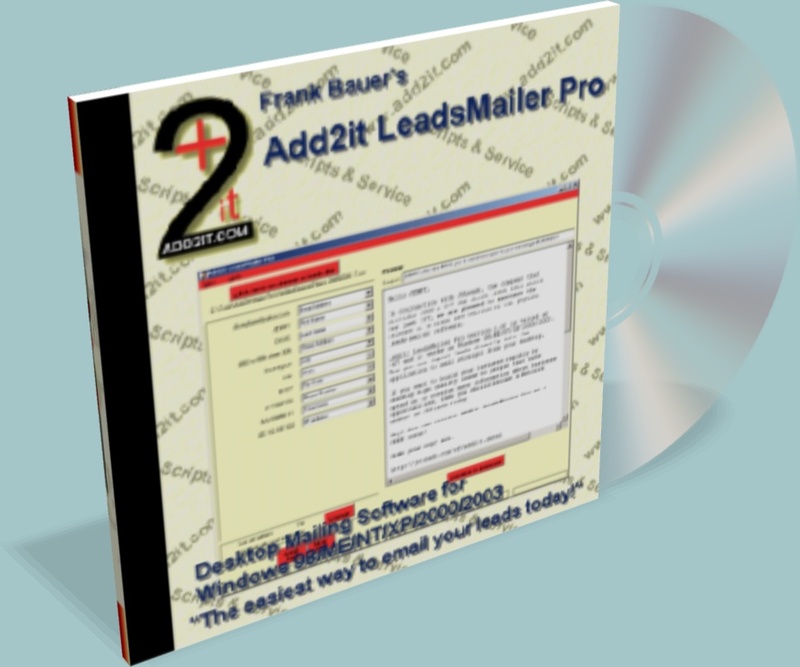 "The features it offers are second to none..."
"Add2it LeadsMailer Pro is going to be my main advertising source as it is far easier to use than any other desktop mailer than I have come across! The features it offers are second to none in fact I have seen only one other software package that come's close and this still doesn't compare to Add2it software as they charge a small fortune to unlock it's full use where with Add2it one small purchase and you have full features. Thanks again, I will never stop using your product!" If you have any questions about Add2it LeadsMailer Pro you may contact me at anytime. P.S. : To see how Add2it LeadsMailer Pro works, click here for the manual!